Opposition to immigration is always rooted in racism, whether someone realises it or not. We’ll examine the main arguments, that working people who immigrate are “stealing” jobs; that they depress wages; that they stress the welfare system; and that they over-burden local housing or transport systems. All of these arguments are ultimately based on prejudice. One may argue that surely any immigration puts additional pressure on the job market of that area. 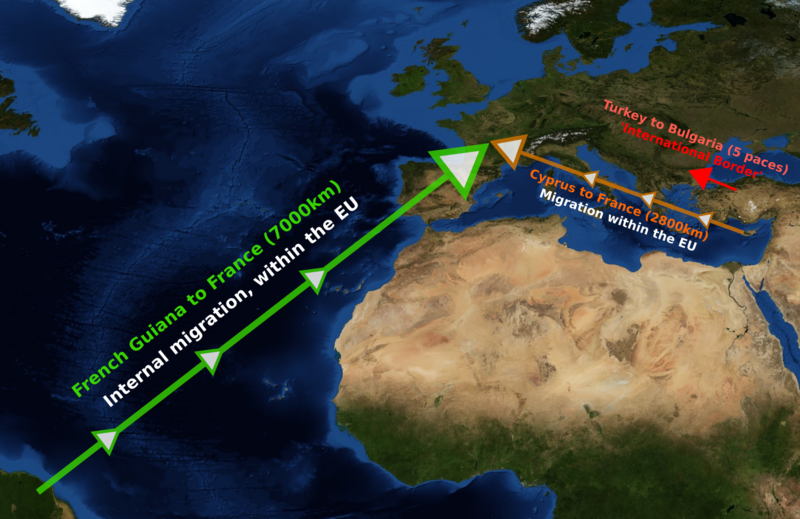 But this applies to any migration to the area, even if it comes from within that country’s borders, and therefore it could not possibly be used as an argument for tighter immigration controls, which specifically targets migration over the national border and ignores migration within the borders. It can only be seen as nationalist or as racist to make a distinction between the two, and if people value their freedom in being able to migrate around their own country and across state and county borders, then they would be operating double standards if they favoured control on immigration. That might be understandable if they are racist. This leads to the bizarre situation that a short hop across the border from Mexico to the United States - say a 20 mile journey to San Diego - is subject to strict controls and severe stigmatisation, whereas a 3000 mile trek from Maine to the same destination does not count as immigration at all. It should be obvious that both of these migrations will have the same impact (if any) on the competition for jobs in the destination. 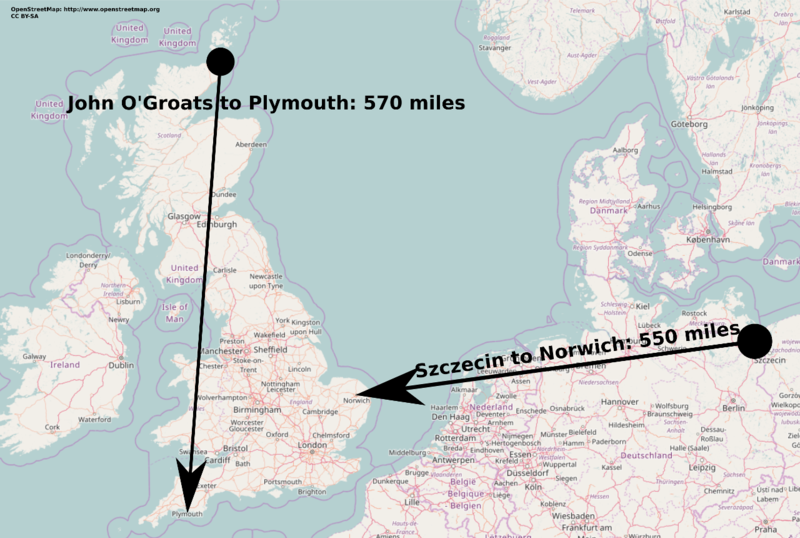 Similarly, it’s perfectly acceptable for someone to migrate 570 miles from John O’Groats to Plymouth, within the UK’s borders, but anti-EU hysteria contends that the 550 mile journey from Szczecin, Poland to Norwich, is unacceptable. Another example of illogical national and EU borders is in the image below. As we have seen, an increase in the available workforce in a region may increase competition for jobs - although this still depends on various factors such as the available skills. If there is more competition, then employers gain the upper hand in negotiating wages - they can employ people for less money because the alternative is not getting a job at all. In this respect the labour market behaves like any other market, where an increase in the supply of labour reduces its ‘price’. Again, this effect will come about regardless of whether the increased competition is due to migration within the national borders, from outside the borders, or even just from a high birth rate in the given region. People migrate, amongst other reasons, to escape low wages, moving to a market where their labour is worth more. Preventing migration means that workers in poorer countries are forced to accept low wages, resulting in a structurally unequal world market based on a racist and nationalist exploitation of labour, with transfers of wealth towards the races and nations which are already powerful and rich. Worse, strict migration controls don’t always succeed in stopping migration, and this leads to a situation where illegal immigrants are exploited in the host country rather than in their home country because their ‘illegal’ status forces them to accept any given conditions. Either way, controlling migration is always just a way of devaluing people based on their nationality or race. With open borders, the free market would work better, smoothing out the price of labour across the world. People in densely populated regions with lots of job competition would migrate elsewhere, perhaps depressing wages in the destination, but simultaneously increasing wages in the point of departure as the competition lessens (other things being equal). Because they focus on ‘immigration’ and not ‘migration’, people often fear an endless torrent of new arrivals, as if the whole world might decide to pour into a single neighbourhood if left unchecked - but simple market forces ensure that this just doesn’t happen in practice. Controls on immigration are nothing more than a protectionist policy applied to the labour market, a racket in which the value of one race’s labour is kept artificially high, so that they can profit from the artificially undervalued labour of others. A similar argument is that a higher population puts a greater burden on local infrastructure, such as roads, public transport and housing. But just like with the job market, this fact clearly applies to any migration, including migration from within the country’s borders. Whether people migrate from Bangalore to Birmingham or from Bangor to Birmingham, it will put more pressure on Birmingham’s local infrastructure. How should we respond to that? Either we should ban all migration into Birmingham, or we should invest in Birmingham’s infrastructure to cope with the increased population. But as soon as we make a distinction between one kind of migration and the other, then we are making a value judgement about the kind of person who is and is not allowed to reside in Birmingham. A person from Bangor is entitled to settle in Birmingham, while a person from Bangalore must jump additional hurdles, treated differently simply because of their nationality. This is a form of unjust discrimination. At the same time, we need to identify the reasons why people migrate and take a more global approach. Remember, every immigration is also an emigration, to the point where it is inherently deceptive to talk about immigration on its own. All that matters when you talk about “immigration” is your own country. Migration is often caused by economic imbalances or by persecution and war. The long-term solution to these issues is to promote peaceful development the world over, rather than myopically ignore any problem that exists on the other side of an imaginary line. That is why ultimately my conviction for open borders inevitably bleeds into my conviction for a world with no borders - that is, one in which people claim no nation and where investments and public services have a global scope. The last argument - that non-working immigrants stress the welfare system - clearly only applies when there are more non-working people who migrate compared to working people. In the US and Europe, most of the migration that xenophobes problematise concerns young working-age people, who would in fact be a net benefit to state finances, so long as they are allowed to work. In fact it could be argued that those regions badly need such people to counteract the demographic transition - i.e. their growing elderly populations. Welfare will generally cost more if there are more people of retirement age, more job-seekers, or more sick or disabled people. So why are immigrants demonised for burdening welfare, but not, for example, old people? More pertinently, why are elderly foreigners demonised, while domestic elderly people aren’t? Why demonise an unemployed foreigner more than an unemployed native? Both will increase the welfare bill, after all. Let’s not forget that what people may call ‘controls on immigration’ are in fact forms of violence - through deportations, detention centres and border security that boasts a varying level of militarisation. What we have to answer therefore, is not just why an unemployed foreigner should be problematised for needing social protection, but why they should be the object of state violence as a consequence, while a native unemployed person should fear no such thing. There are concerns that if a country has a generous welfare system, then people will migrate to take advantage of it, or “sponge off of it”. But my point bears repeating: why problematise this when foreigners do it, but not when natives do it? I think I know exactly why: racism. Dividing people into immigrant/citizen or foreigner/native categories is inherently a nationalistic value judgement that some people deserve welfare while others do not, just as some people ‘deserve’ a job and others ‘steal’ it. It speaks volumes that immigrants are demonised both when they work and when they don’t work. Presumably the anti-immigrant utopia involves everyone staying in the exact neighbourhood they were born in for their entire lives, lest they dare upset the delicate balance of another region’s economy. Again though, co-operation beyond borders could help enormously. A supra-national or international social security system would ensure that people receive welfare benefits regardless of where in the world they live. In a more interconnected labour market, these kinds of schemes are long overdue. Right now, the country you are born in will shape the course of the rest of your life. Nobody chooses the country of their birth. And depending on who you are, you might never be allowed to leave that country. Its borders were defined years ago by historical wars and ancient tribal migrations. Freedom of movement needs to be a fundamental human right, for a freer and fairer labour market, for cultural exchange, for individual liberty, and to compensate humanity for their unchosen place of birth. It is not only unjust but cruel, that millions of children are born into poverty, and then denied the right to seek a better life elsewhere, purely because they had the misfortune to be created on the wrong side of a line that they had no say in defining.